uuid : 1801c8d4-c380-48c2-a159-d367abc2c5e7 templates_id: 119492 templates_uuid: "fc078b6d-bc41-4704-949d-b0f9f1f2651e" title: "Offer of Employment Letter - Create a Job Offer Letter Online" display_name: "Job offer letter" meta_keywords: "Offer of employment letter and Offer letter" description: "
Attract the best recruits with a clear statement of key job terms with this offer of employment letter. This straightforward job offer letter ensures your chosen candidate has all the information they need to accept the job and gains a favourable impression of your business. This offer letter is written in a friendly tone and sets out offer conditions such as references and permission to work in the UK. It also covers key terms including duties, pay, benefits, hours and place of work, holiday, notice or contract duration. A job offer letter is a letter offering employment following an interview. It summarises the main terms offered or can be a starting point for negotiation of employment terms. Do I need a job offer letter? You need a job offer letter when you want to employ someone new or when you want to make a formal offer before you\302\222re ready to sign an employment contract. This will ensure that both sides understand the main terms of the prospective employment. What conditions have to be satisfied to make this offer of employment valid? In this letter you can choose to offer employment upon conditions that need to be satisfied before employment starts such as: providing references, holding a specific qualification, having their qualifications verified, completing a medical questionnaire or simply upon signing this letter. Do you need to provide a separate contract of employment after sending this letter? Yes, this letter sets out only the basic terms of employment, and could lead to negotiation of employment with your prospective employee. Normally, an employer will leave sufficient time for sending the employment contract separately once the employee satisfies the condition/s of the offer or upon signature. However if there are no conditions to satisfy or these have already been satisfied an employer may send both together. How long is the job offer letter valid for? In this document you can choose give a deadline for the prospective employee to accept the offer. Once the deadline passes, the offer is no longer valid.
" created_timestamp: "2018-10-08 04:36:23.0" modified_timestamp: "2018-10-08 04:36:23.0" active: true created_by: 236 modified_by: 236 dcm_id: 160 url_slug: "Offer-of-employment-letter" meta_description: "Prepare a job offer letter with simple guidance from Rocket Lawyer. Attract the best recruits with a clear statement of key job terms with help from expert solicitors when you need it. Try Rocket Lawyer\'s offer letter. " time_to_complete: "20 minutes" role1: "Prospective employer" role2: "Prospective employee"
You need a job offer letter when you want to employ someone new or when you want to make a formal offer before youre ready to sign an employment contract. This will ensure that both sides understand the main terms of the prospective employment. More than just a Job offer letter template, our step-by-step interview and guidance makes it easy to create your document. Easily create online, download, print and sign your free Job offer letter in minutes. 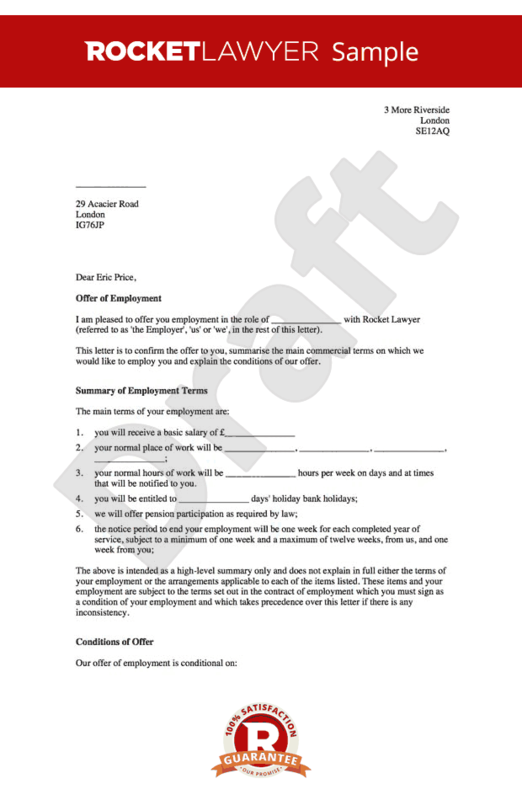 This document is also sometimes called: Offer of employment letter and Offer letter.